Four quality artist portfolios made from sturdy weather-resistant black vinyl. 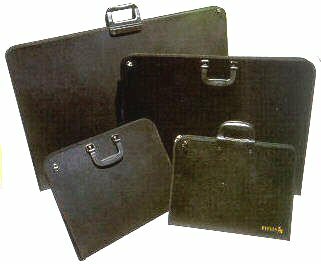 Ideal for transportation and protecting your artwork. Shoulder strap included with each portfolio. WNR84906 24.4" x 36.4" x 1.5"
21.7" x 29.2" x 1.5"
14.6" x 19" x 1.5"
11.5" x 15.5" x 1.5"
More information about the sizes and what is available to come later.